Governor Umar Ganduje of Kano state has reacted to the the trending story of a 'video' showing him receiving $5 million bribe from contractors. The governor has threatened lawsuit after a news platform reported that he had been caught receiving at least $5 million in kickbacks from contractors. “We wish to state that there is no iota of truth to these allegations and if indeed there is any such alleged video, it is at best cloned,” Muhammad Garba said in a statement on Thursday. Mr Garba claimed that the video comes as prominent Nigerians are becoming increasingly susceptible to manufactured video clips being used to cast them in a bad light before the public. He also alleged that there was an attempt to blackmail the governor which failed, prompting those the commissioner said were opposition elements to push the video out. But the website said the videos had been authenticated by its internal and independent graphics experts, adding that President Muhammadu Buhari had ordered a thorough investigation after viewing the clips. 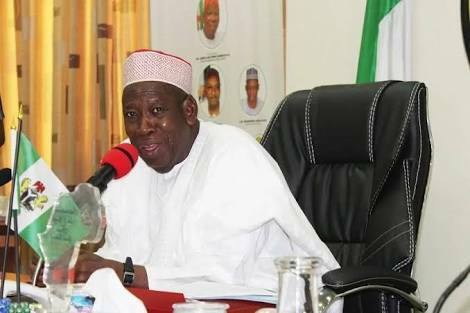 The allegations are now being strongly denied by Mr Ganduje, with his office threatening grave consequences against the publisher. Strangely, the publisher, Jafaar Jafaar has gone into hiding since last night following threats to his life.